The Arizona Coyotes have disastrously begun the season 0-4-1. The reasons are aplenty. There have been defensive turnovers, coverage breakdowns, mental errors, and lazy plays, but one of the more noticeable failings this season has been the goaltending. In June, the Coyotes departed with long-time starting goaltender Mike Smith when they traded him to the Calgary Flames for defenseman prospect Brandon Hickey, a conditional third-round draft pick, and free-agent goaltender Chad Johnson, whose only purpose was to fill an expansion draft roster exposure spot. 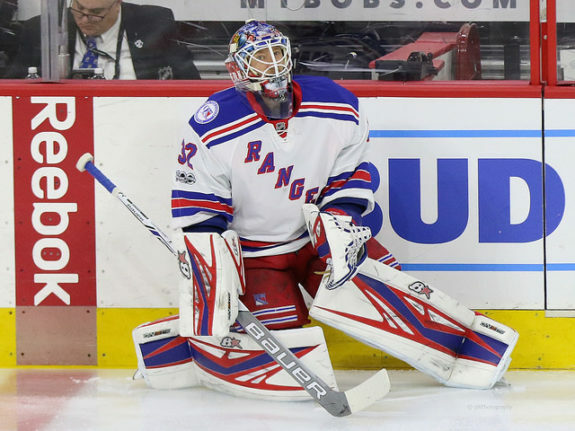 A few days later, the Coyotes brought goaltender Antti Raanta to Arizona in a blockbuster trade with the New York Rangers. Raanta was quickly labeled as the Coyotes new starting goaltender despite never starting in more than 26 games in a season during his career. Raanta has played well for the Coyotes this season, except for a lopsided loss to the Vegas Golden Knights. However, Raanta has struggled to stay healthy. He missed most of the preseason with a lower-body injury and left the October 12 game against Detroit after the first period with another lower body injury. Raanta’s injury issues have thrust backup goaltender Louis Domingue into the spotlight. Domingue has played in all but one of Arizona’s games and is 0-3-0 with a .862 save percentage (SV%) and 4.55 goals against average (GAA). Domingue, now in his fourth season with the Coyotes, has shown promise at times. He has the ability to make great saves, but has long struggled with consistency. While making several highlight-reel stops in a game, he often gives up a soft goal or two which overshadows his otherwise stellar play. Domingue has yet to prove that he can be counted on for quality starts night after night. This season, Domingue has especially struggled with his right-handed catching glove. The Coyotes blew a three-goal lead in their season opener in Anaheim. The game-winning goal by Ducks forward Rickard Rakell was from distance and a poor angle, yet Domingue’s glove hand whiffed on the save attempt. Thursday against Detroit, Domingue’s glove missed a shot from outside the faceoff circle by Red Wings forward Martin Frk. Another soft goal to Henrik Zetterberg didn’t help Arizona’s cause in that game. On Saturday against the Boston Bruins, Domingue was unable to catch a non-threatening shot from Danton Heinen. The puck dropped out of Domingue’s glove and Bruins forward Tim Schaller pounced on the rebound. Domingue’s status with the Coyotes is starting to become in doubt. After four years of inconsistent play, Arizona could possibly look elsewhere for its backup goaltending role. 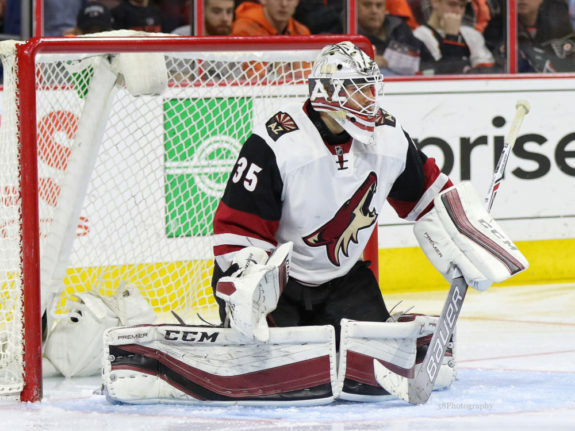 The Coyotes boast a few net-minding prospects who could plausibly start an NHL game in the near future depending on how long Raanta’s injury lasts. 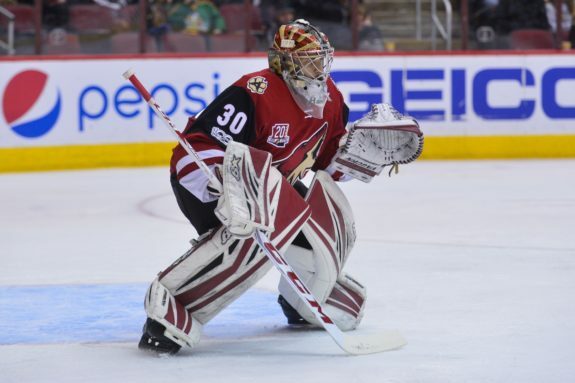 On Monday, the Coyotes recalled goaltender Adin Hill from the Tucson Roadrunners of the AHL. The 21-year-old Calgary native was a third-round selection by Arizona in the 2015 NHL draft. The big 6-foot-6-inch goaltender played in 40 games for the Roadrunners last season with .906 SV% and a 3.16 GAA. On Saturday, Hill recorded a 22-save shutout on the road against the Bakersfield Condors. Hill’s recall indicates that he may possibly make his NHL debut this week. Friday, the Coyotes recalled Marek Langhamer from the Tucson on an emergency basis due to Raanta’s injury. However, on Monday he was sent back down when the Coyotes recalled Hill. The 23-year-old, Czech-born goaltender has only played in one NHL game in his career, but has never started. Last season in Tucson, Langhamer played in 25 games, had a .902 SV% and a 3.36 GAA. Langhamer was a seventh-round draft pick of the Coyotes in 2012. This past offseason, the Coyotes signed undrafted goaltender Hunter Miska to an entry-level contract. 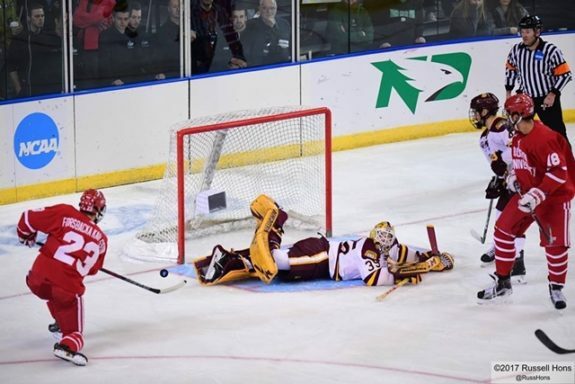 Last season the 21-year-old Miska posted a 27-5-5 record for the University of Minnesota-Duluth as he led them to the NCAA Frozen Four Championship game. Miska finished the season with a .920 SV% and a 2.20 GAA. Miska was a Mike Richter award finalist for most outstanding goaltending in NCAA Division I hockey. However, Miska may not be ready for the NHL. In his only career AHL start earlier this season, he gave up six goals and was pulled in the second period.